Our recent survey of 1,051 voters in Illinois shows that there is an overwhelmingly negative reaction to Bruce Rauner’s proposed cuts to state home-care and child- care programs. Opposition to Rauner’s cuts crosses party lines, suggesting that legislators who back his cuts would be put in significant jeopardy regardless of the party composition of their districts. Rauner already has deep vulnerabilities with Illinois voters because he is perceived to be more interested in doing what’s best for the wealthy and big corporations than in doing what’s best for average people in the state. Rauner’s proposed cuts to home care and child care exacerbate these vulnerabilities, as do his efforts to undercut the workers who provide these services. The survey results show that by a lopsided margin Illinois voters are more likely to side with home-care and child- care providers than with Governor Rauner in a major policy disagreement. 1. There is strong opposition across party lines when voters hear about Bruce Rauner’s proposed cuts to state home-care and child-care programs. Fully 73% of all voters in Illinois say they would have an unfavorable reaction if they heard that Governor Rauner wants to make large cuts in state government funding for in-home assistance for seniors and people with disabilities, including 53% who are very unfavorable. Similarly, 68% react unfavorably upon hearing that Governor Rauner wants to make major cuts in government support for child care, including 47% who are very unfavorable. Large pluralities of Democrats, independents, and Republicans react unfavorably to Rauner’s proposed cuts to home-care and child-care programs. Rauner’s proposed cuts to home care and child care are unpopular even among those who recall voting for him last year. Rauner voters are unfavorable to his home-care cuts by 51% to 20%, and are unfavorable to his child-care cuts by 46% to 26%. 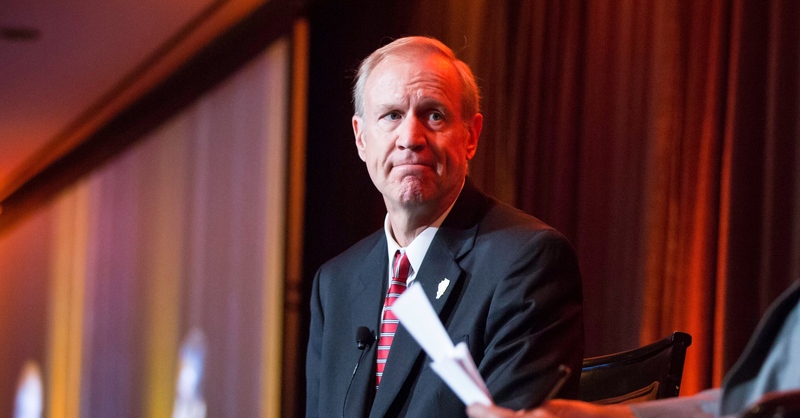 Negative reactions to Governor Rauner’s policies extend to his contract proposals for home-care and child-care providers. 74% are unfavorable to his proposal to cut or totally eliminate health insurance for home-care and child-care providers. 74% are unfavorable to his proposal to eliminate reimbursement for equipment, protective garments, and supplies (including latex gloves) for home-care providers. 73% are unfavorable to his proposal to eliminate training and professional development for home-care and child-care providers. 62% are unfavorable to his proposals to freeze the pay for home-care and child-care workers. 2. Illinois voters already are skeptical about Bruce Rauner when it comes to caring about people like them or understanding the challenges of working-class families, and the plurality say he is more interested in the wealthy and big corporations than in what’s best for average people. These negative perceptions create a significant vulnerability for Rauner in the debate on home care and child care. Just 40% of voters in Illinois have confidence in Bruce Rauner when it comes to looking out for the middle class, while 50% have doubts about him. Similarly, by 50% to 41%, voters express doubts about him on “caring about people like you.” Rauner especially lacks credibility with voters on understanding the challenges faced by low-wage workers and working-class families, with 58% expressing doubts about him. When asked which matters more to Bruce Rauner, only 31% say his priority is doing what’s best for average people in Illinois, while 46% say he is more interested in doing what’s best for the wealthy and big corporations. 3. Voters in Illinois have positive feelings about home-care and child-care providers. In a fight between these providers and Governor Rauner, voters in Illinois side with home-care and child-care providers by a margin of close to three to one. Voters support the right of home-care and child-care workers to have a union, and they react unfavorably to aspects of Rauner’s contract proposals that would weaken the union. Fully 75% of Illinois voters report having a positive opinion of child-care providers, and 72% are similarly positive to home-care providers. In a dispute between Governor Rauner and home-care and child-care providers, only 21% of voters say they would side with Rauner, while 61% say they would side with the home-care and child-care workers. 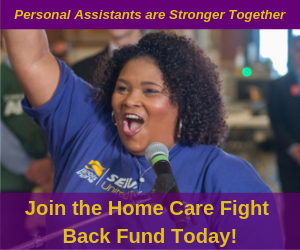 By 60% to 29%, voters support home-care and child-care providers being represented by a union to negotiate with the state on issues involving pay, benefits, working conditions, and training. Sixty percent (60%) of voters react unfavorably (including 45% who are very unfavorable) when they hear that Governor Rauner wants to weaken the union that represents home-care and child-care providers, and 66% are unfavorable when they hear that he wants to stop home-care and child- care providers from joining together to have a voice at work. Voters are not persuaded by a defense that Rauner’s proposals are necessary because the state budget is “out of control” and that average taxpayers will end up paying the price “if we don’t take action now to hold the line on excessive union contracts.” Surprisingly, 60% say this line of argument makes them no more likely at all to support Governor Rauner’s proposals. Given these results, it is safe to assume that voters across Illinois want their state legislators to stand with home-care and child-care providers instead of Bruce Rauner, and that those legislators who instead align themselves with Rauner’s unpopular policies would be creating significant political jeopardy for themselves. The results in this memo are based on telephone interviews with 1,051 likely voters in the 2016 elections in Illinois. The interviews were conducted from June 2 to 7, 2015, and the statewide sample provides a representative cross section of the Illinois electorate.